Astrophysicist Neil deGrasse Tyson on the set of the late-night, science-themed TV show "StarTalk," which is filmed in front of a live studio audience at the American Museum of Natural History. Neil deGrasse Tyson's late-night, science-themed talk show, "StarTalk," has been renewed for a second season by the National Geographic Channel. The hour-long show, based on Tyson's long-running radio program of the same name, began airing on April 20. But on April 15, Courteney Monroe, chief executive of the National Geographic Channel, announced at a news briefing that the show has been green-lighted for a 10-episode second season, according to Variety. 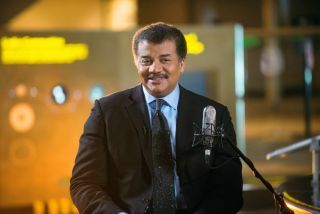 Tyson, who is known for popularizing science through social media and television, is also the director of the Hayden Planetarium at the American Museum of Natural History (AMNH) in New York. He has described "StarTalk" as a "three-strand braid, between science, humor and pop culture." Each week, Tyson is joined by two "co-hosts" (often a comedian and a scientist). The show then revolves around clips from a pretaped interview with another celebrity or science figure. Guests on the first season of "StarTalk" have included "Star Trek" alum George Takai (April 20), "Interstellar" director Christopher Nolan (April 27), astronaut Chris Hadfield (June 1) and NASA Administrator Charles Bolden (June 15). Guest hosts have included Janna Levin, professor of astronomy and physics at Columbia University (April 27), and astronaut Mike Massimino (June 1). Tyson is also the host of "Cosmos: A Spacetime Odyssey," which is an updated version of the 1980 series "Cosmos: A Personal Voyage," hosted by Carl Sagan. New episodes of the first season of "StarTalk" air Mondays on the National Geographic Channel at 11 p.m. EDT/10 p.m. CDT (check local listings). The last two episodes of the 10-episode first season will air June 15 and June 22.